We’ve had leaked screenshots, bootleg recordings of trailers, and extensive descriptions of some of the show’s pivotal scenes – now, Marvel and ABC have cut through the white noise to announce a premiere date for Inhumans: Friday, September 29th. Kicking things off with a two-part premiere, Marvel’s Royal Family will grace the small screen following a two-week stint in IMAX theaters, where the show’s “cinema-quality” visual effects ought to flourish. 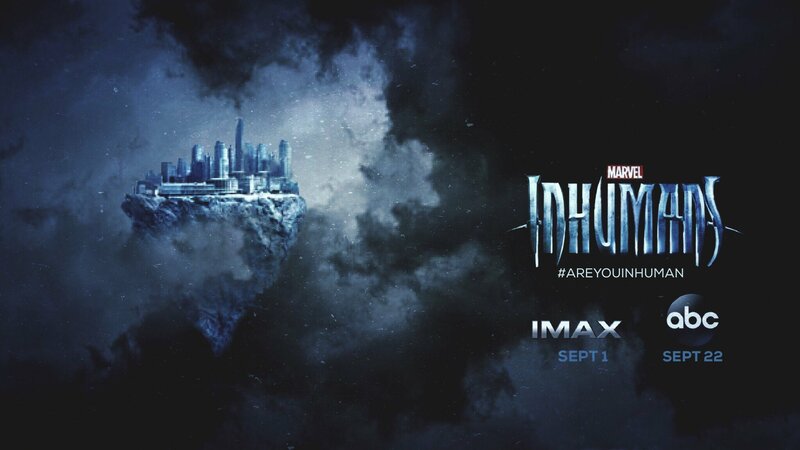 Participating theaters will begin screening Inhumans‘ two-part opener from September 1st, which means that unless you’re venturing out to catch Black Bolt, Maximus, and Medusa on the large-screen format, you’ll want to stay off Twitter and other social forums in fear of stumbling upon any Inhumans-related spoilers. In tandem with the announcement, two new one-sheets were unleashed: one poster, and one banner designed to tease the otherworldly city of Attilan. Not unlike Cloud City or the floating metropolis of Dalaran in World of Warcraft, Attilan appears to be suspended in orbit, and we know from those previous trailers that the homeworld of the Inhumans is about to be corrupted by tyranny and treason, as Maximus attempts to overthrow his older brother, Black Bolt (Anson Mount). Rounding out the stellar ensemble are Eme Ikwuakor as Gorgon, Isabelle Cornish as Crystal, Ken Leung as Karnak, Ellen Woglom as an undisclosed character, Sonya Balmores as Auran, and Mike Moh as Triton. Inhumans kicks off its eight-episode run with a two-part premiere on Friday, September 29th at 8-10 pm. Will you be tuning in? Or are you more inclined to catch Marvel’s Royal Family in IMAX from September 1st? Do let us know.